Please mention here the scope and objective of the project. Draw the organizational structure. This should reflect the formal structure of the organization. Also note down informal working structure, if any also. Note if it is a hierarchical or matrix structure. Employee Strength : Total strength. Also mention if there are casual employees. Number of Transactions/day : How many transaction of different kind are done. For example in Stores how many times material is received and material is issued. Process Name: Name of the process. The name should reflect the nature of the process. For example Purchase High Cost Material. 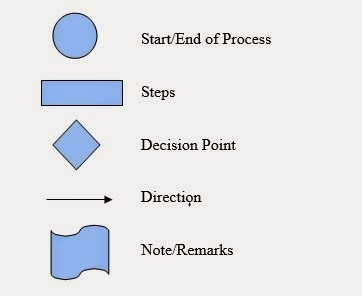 Starting Department : The department which starts the process. If it can be any department than just say Department. For example a Purchase process can be started by any department. So just mention Department. Ending Department : The department which ends the process. If it can be any department than just say Department. For example an indent process can end at any department. So just mention Department. For richer notation one can adopt BPMN notation also. · Cycle time : The time it takes to complete the process. · Setup Time : How much time is required to set up things so that the process can start serving. Configuration : Make including processor size. Status : Are the machines in usable condition? If for same configuration there are some of the machine usable and some not usable than make two different line entries. Draw the topology of the current setup including network bandwidth. Database : For what purpose this database is used? Who is the database vendor? Type of Data : What is the scope of data in the database? What important master and transactional data it contains? No. of Tables/Procedures/Views : How many tables, procedure and views this database contains? Size of database : A rough estimate of the size of database. Describe the changes that need to bring in the organization. Draw the organization structure again. This may or may not change as per the scope of the project. What is the proposed IT setup? Draw the new network topology. Also note down the hardware and software requirements. Draw the diagram that how the different softwares will be deployed. Hard Disk : Hard disk size. To be procure : Whether the existing machines can be used or need to procure new once. Configuration : Details of hardware. To be Procured : Whether the existing item can be used. Software: Software to be procured. Qty. : Quantity to be procured. Details : Details of the software including purpose. OpenSource / Freeware / Licenses : Type of software. To be Procured : If the software needs to be purchased. Same as in Section 4 . This time done for changed processes. Same as in Section 4. This time done for changed processes. Mention the plan that how the changes will be done including the steps. · Which department and processes will be done in which sequence? · What steps are taken to ensure that the downtime for the organization is minimum. · How the testing of changed processes is done? ·In case of bugs, the process to handle it and how to introduce the fix.